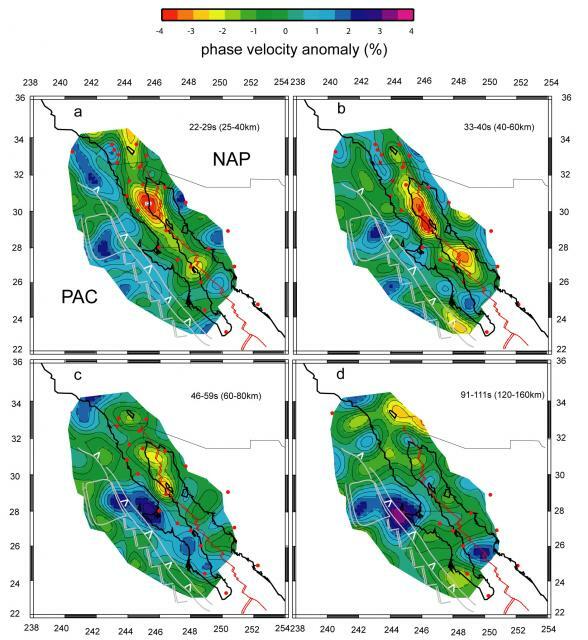 Phase velocity anomalies of Rayleigh waves in four period ranges in the vicinity of the Gulf of California and Baja California. Each period range is most sensitive to shear velocity in the depth range indicated in the upper right corner of the figures. Location of seismometers indicated by red dots (NARS-Baja, RESBAN and Calnet stations). Current plate boundary in red lines, fossil boundaries in grey. Image from the MARGINS 2008 Decadal Review research nugget.